Police officer Calon Mautholos has grown to despise Olympus following his wife's suicide, blaming her death on the lack of creative freedom caused by the rules binding the citizens of the city. As his hatred for the city grows, Calon conspires with the terrorist A.J. Sebastian to destroy the Legislature of the Central Management Bureau to send the rules of Olympus that killed his wife tumbling down. But when Calon discovers it is not political malcontent, but rather hatred for bioroids that motives Sebastian, Calon turns renegade and gains the attention of city officials. Deunan Knute and her partner Briareos of the ESWAT counter-terrorism unit are dispatched to hunt down and stop Calon and Sebastian... by any means necessary! The OVA has an almost completely original storyline, only sharing some of the characters and the setting with the source material. Given that the newer versions of Appleseed have become popular, I figured that I might as well write a review for the lesser known film. It was created in '88 by the man who I believe created Big O. For some strange reason, it took damn near a decade to bring it from Japan to the US. The story is similar to many other Olympus outings: terrorists trying to bring down the Utopian society so that humanity doesn't become like a caged animal. Generally, this means destroying Gaia, which is the main goal of our two terrorists. The story's decent, and it picks and chooses parts from the 1st and 2nd volumes of the Appleseed series to have in the film. Ultimately, the story satisfied me, so I have no complaints about that. My main complaint is with whoever they got to do the voice over work. My god, the V/Os for the English dub are awful. Seriously, everyone sounds like a stereotypical New Yorker, and if it's not that then its the fact that it all sounds like it was recorded in a tin can--echoey (is echoey a word?). A curse word is added to every sentence like a period, and this is also only in the English dub. I watched the movie once in both Japanese and English, and while both adaptations are fair, the original language is the one to watch (some things get cut from the American version, for whatever reason). The characters are roughly the same in the manga. The one I enjoy the most has to be Hitomi, who wasn't done any justice in the recent 04 movie. I don't know what it is, but all the bioroids act like humans instead of clones in both this and in the manga, a thing that the recent films just hasn't really touched on, at least not yet. All and all, I enjoyed this, but not as much as I expected. It's good to see where Appleseed originates, but don't dive into it with high hopes. If you can stand the ancient graphics and potentially deadly V/Os, then this could be a decent movie for you. This anime lacks a certain... something... Nothing seems to be horribly wrong, but at the end of the day, it's no more than mediocre. The best word to describe this anime is "bland". It's like drinking water - I don't hate it, but it just doesn't really leave much taste behind. I had a really hard job trying to get excited when watching it because, frankly, there's nothing about it that's very interesting. Going through everything categorically: the animation... not bad, but not amazing. Music... so bland I can't even remember much about it (though I guess that must mean it can't have been bad at least). The story didn't really inspire. They failed miserably to engage my emotions with their boring dilemmas because they couldn't put together a convincing case about why I should give a toss about it. In addition, parts of the storyline seem a bit muddled up, though that's possibly because my attention was wandering at that point. The characters annoyed me a bit. The police in the anime are a joke. They seem to have no sense of responsibility, and are able to just do things like transfer to a different division without any restraint, as though they are free to do whatever they want. Do they have no superior officers to report to?! Appleseed is a work that seems to show up every now and then, after many of us have forgotten it, usually in the form of a reboot or remake. As it stands, the original 1988 anime is the best of the anime versions, so far, but it is not without its flaws. Appleseed is one of a minority of animated works that can lay claim to being too short. There's is just way too much going on for a single 1 hour film, but, to director Kazuyoshi Katayama's credit, he manages to keep the threads of storyline together enough to make this a largely enjoyable fare. One thing that Appleseed, this 1988 version, does much better than the 2004 version, is moral ambiguity. This sci-fi is ripe with it. Earth is introduced to us having recently suffered catatrophe through World War III. Olympus, a protoype "utopia" of sorts, is the setting, where in step the Bioroids, genetically engineered beings, created by humans, to oversee society and prevent another near apocalyptic event from occuring. As with most political scenarios where control is vested in some people, there are others who want it. The Bioroids, while they do a decent job maintaining peace, are also in total political control of Olympus. This doesn't go over to well with certain humans, who view Olympus as a cage. One refreshing thing about this anime is the tag team duo of protagonists, Deunan, a very skilled female E.S.W.A.T (read; Special Ops) member, and her partner, the human on the inside, cyborg on the outside, Briareos. Deunan is thrust into the conflict of humans seeking to wrestle power from the Bioroids, and she follows her convictions to their conclusions. Whether or not she makes the right choice at the conclusion of the film is debatable, but it's one of the endearing features of the work.She shines here as a strong female lead, and her relationship with Briareos doesn't fall into a rushed, corny romance trap that we often expect of works like this. Another note; for an 80s anime, there is a surprising amount of women in positions of power here. This whole conflict that takes place is complicated with E.S.W.A.T mole(s) corraborating with the humans seeking power, a meddling prime minister, and the computer helping to run the whole show, all of these setting the stage for a solid sci-fi thriller. However, as I alluded to earlier, the one hour runtime just isn't enough. When you combine these subplots with the various, lengthy action sequences, it becomes apparent that plot development is given the fast track, often to the detriment of the work. Plot developments and devices are introduced almost haphazardly at times, and you're given little time to contemplate on the importance of one thing before another important one springs up. To this point, one major plot device, inolving the character Hitomi, who is, essentially, the key to everything, is severely mishandled. It's thrust into the film in mere seconds even though it is such a crucial point. The ending is a bit of a mess too, featuring a terribly cheesy Star Wars like apparition imparting words of wisdom. It's almost comical. 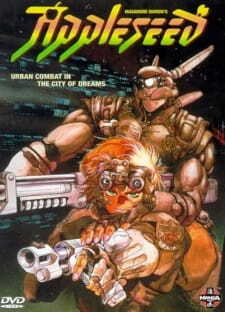 That said, the Appleseed universe is a very compelling one because it takes the sci-fi genre and puts a new spin on it. The Bioroids are right to have grievances in that they are meant to serve humans, the humans are right to have grievances in that they have little political power, and so, you have a great setup here with no true good guys or bad guys. Sadly, the potential feels a bit wasted with the rushed nature, but the strong characters, particularly Deunan, and the compelling scenario and moral conflict largely allow Appleseed to be an enjoyable work. I don’t even know what to say before going over this one… Here’s an OVA of Appleseed. After World War III, the General Management Control Office construct an experimental city known as Olympus inhabited by humans, cyborgs and bioroids. Bioroids are a genetically engineered being created to serve mankind. They run all administration of Olympus. Olympus was meant to be a utopian society. But for some it is less of a utopia and more of a cage. Calon Mautholos, an Olympus city police officer, is one of these people. Things run amok when a terrorist, A. J. Sebastian, plans to destroy Gaia, a super computer that runs Olympus. Out to stop him are Olympus city police SWAT team members Deunan Knute and Briareos Hecatonchires. Deunan and Briareos are determined to stop the terrorist plot at all costs. To be technical, this is a production of 5 studios. which are AIC, Bandai Visual, MOVIC, Tohokushinsha Film Corporation, and even Gainax. Does this movie hold up now that it has 5 studios. Not exactly. Even though this was made in 1988, the animation does have some problems in this OVA. It’s interesting to note that regarding the Appleseed franchise. I discovered that this is the only entry that has the traditional hand-painted cels. All the other entries in Appleseed after this is CG animated. The animation in this OVA is okay is not very good though,. But I will say this fun fact. Hideaki Anno was the mechanical supervisor for this OVA. The music by Norimasa Yamanaka is one big problem. There are not many themes in this movie and there is one specific tune you will be hearing quite often. Don’t ask me what the song title is because I don’t know. The soundtrack is not even all that great and the fact that the movie uses a specific tune like 4 or 5 times within an hour. That’s not a good sign. Yamanaka-san’s other compositions are on other shows that some people probably don’t know either and there’s not much to be said on the music here. It overplays a tune and it’s a disappointment. The Japanese cast is pretty decent, Masako Katsuki is good as Deunan. Yoshisada Sakaguchi is decent as Briareos. Mayumi Shou is also decent as Hitomi. Toshiko Sawada is also decent as Athena. Toshio Furukawa is surprisingly really good as Calon, and this OVA somehow got Norio Wakamoto to play A.J. Sebastian. So that’s pretty cool. When it comes to the dub. The pronunciations are pretty different, The dub is a little hit and miss. Larissa Murray is ok as Deunan. Bill Roberts is a bit hit and miss as Briareos (Bularios in the dub). Alan Marriot is ok as Calon (Karon in the dub) Julia Brahms is ok as Hitomi, Lorelei King is ok as Athena. Vincent Marzello is hit and miss as A.J. Sebastian. The dub is listenable if you don’t mind hearing cheesy voices. It’s an ok dub and I expected the dub to be not all that great because it was old. The ADR direction by Jill Wilmot is hit and miss as the end result. But both casts aren’t that impressive. If you’re gonna expect much out of the characters, you are sadly out of luck. This OVA lasted 65 minutes and every single character in this OVA is not developed all that well. Deunan is okay I guess. Briareos looks like a Bio-Android with robotic bunny ears. Athena is alright I guess. Hitomi (even though there’s a little secret) isn’t developed that much either, Calon is ok, and A.J. Sebastian is just a stock villian. All of this in 65 minutes. It gets worse. The story is not even interesting and it is not written well because the OVA doesn’t give enough time for the viewer to get adjusted to the settings. It is a bit rushed too. The story is also really forgettable and it really feels like a commercial for Masamune Shirow’s manga of the same name. That’s what it feels like to me. At the time I am making this review, I have not read the manga… But I hope I get a better experience than this waste of time OVA. The Appleseed OVA was available by Manga Entertainment and it is out of print. With all that said, the Appleseed OVA is mostly a waste of time with it’s shallow plot, characters, and music. The animation isn’t as shallow, but it’s still not good. Take my advice and skip this one unless you are a completionist while viewing certain franchises. I give the Appleseed OVA a 2.6 out of 10. it is BAD!